"When we say 'ultimate,' we mean it. 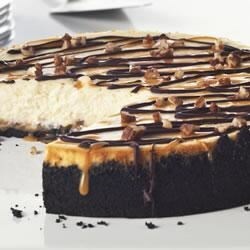 This delectable cheesecake boasts an OREO Cookie crust topped with a nutty layer of caramel and a classic cheesecake filling. Drizzles of melted chocolate and caramel-pecan sauce finish it off in style." I loved this recipe. Will use over and over again. Next time I think I will omit the caramel layer on the crust. Everything else I will keep to the recipe.